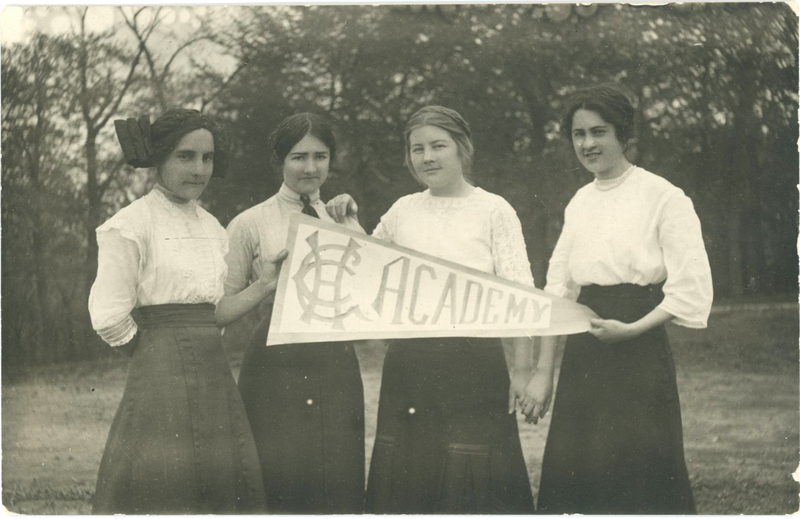 Good Counsel, 1912: Veronica Burfield, Gertrude Mountain, Sara Carey and Irene Culbert, students at Good Counsel Academy, Mankato, Minnesota, 1912-13 school year. This year marks the 100th anniversary of the 1918 Spanish flu, the deadliest pandemic in human history. Over the course of the pandemic, an estimated one-third of the world’s population was infected, and anywhere from 20 to 100 million people were killed by the disease. Death rates were particularly high amongst otherwise healthy adults ages 20-40. In fact, the disease was so severe that the average life expectancy in the United States fell by almost 12 years. Influenza hit the United States hardest in September, October and November 1918. In October alone, more than 100,000 Americans died from the flu and secondary infections, like pneumonia. Antivirals and antibiotics did not exist in 1918, so treatment was limited to home remedies and public health measures such as quarantines and closure of public venues like schools and churches. The following is the chronicle entry from the Good Counsel Motherhouse in Mankato, Minnesota, which describes how the students at Good Counsel Academy were affected by the influenza epidemic. Good Counsel Diary, 1918: An excerpt from a diary, probably kept by a member of the provincial council, detailing the influenza outbreak at Good Counsel.